Discount Flooring Liquidators job is simply to save you money and bring the best customer service we can. We intend to improve your buying experience and strive to bring the best-priced flooring possible on any flooring purchase. 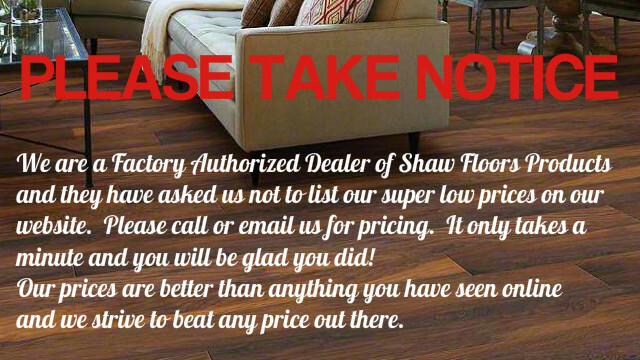 Our products are top of the line Shaw Floors with all the guarantees and warranties in place. Backed up fully by Shaw Floors. You will find only the best hardwood flooring on the market. We bring Beauty and Strength to Any Room. See our Beautiful Collection of Warranted Hardwood Flooring. Laminate Flooring Made in the U.S.A. Worries STOP here with warranties and easy installation are considered from our manufactures first thought. Awesome. Look around and see some Quality Resilient Vinyl Flooring, purchase comes with the best Guarantees in the business, beautiful and affordable. You’re going to love this, we will save you as much a we possibly can on any carpet purchase. Our carpeting is top of the line and some of the best on the market. Look around you’ll be glad you did. Solid hardwood floors bring an elegant touch and unique beauty to any part of your home. The classic appeal stands out when you buy solid wood flooring and it works with a wide range of interiors like boho chic, country, modern and minimalist. These floors are also long-lasting and have high performance, allowing you to enjoy a lifetime of durable flooring through the generations. It’s no wonder that you should invest and buy discount solid wood flooring today. Harwood flooring: With the ultimate prices to suit any budget, our hardwood flooring can add class and sophistication to any room. Have a look at our extensive collection of warranted hardwood floors. Laminate flooring: Our range of warranties and simple installation process makes this a win for our customers. All our laminate flooring range is made here in the U.S.A. and abroad. Resilient vinyl flooring: Looking for some one-of-a-kind vinyl flooring that is sure to impress? Look no further with our affordable and trendy range. Carpeting: At Discount Flooring Liquidators, you will find great offers on carpeting. Find out more about our range of carpets, which are sure to impress! This can be a significant factor when it comes to choosing between solid versus engineered hardwood flooring. In the case of solid wood flooring for sale, it is likely to change its properties based on temperature and moisture. Ideally, it is best for low grade (i.e. ground level) construction. By contrast, engineered hardwood can be installed across levels, on grade, above grade or below grade as it retains structural integrity despite variations in humidity and temperature. With regard to the sub-floor, solid and engineered hardwood floors perform differently. If you buy discount solid wood flooring, it has to be permanently nailed to the subfloor and contractors typically leave some gap between the wall and floor, to account for expansion or contraction. It can only be installed over sub-floors and existing floors made of wood, oriented strand board and plywood. Engineered wood floors can tolerate more wear and tear, making it possible to go over concrete under good conditions. Before you buy solid wood flooring, check out Shaw’s installation guidelines for more ideas on how to install solid and engineered wood flooring to take advantage of their performance attributes. There are 4 colors to choose from. There are 8 colors to choose from. There are 2 colors to choose from. Engineered hardwood core offers a distinct advantage over solid hardwood flooring – it can be installed in many different areas in a house. The cross-grain configuration (multiple layers of wood) used to stack the wood controls shrinkage and expansion of the flooring. Engineered Hardwood Flooring can be installed above grade, on grade, and below grade. Pretty much anywhere in your home. There are 10 colors to choose from. There are 5 colors to choose from. A single ¾” thick piece of hardwood is milled to create solid wood used in solid wood flooring. This flooring adapts to changes in the relative humidity in your home. It does so by expanding when the humidity is high and contracting when it’s low. When solid hardwood flooring is installed, a gap is left between the floor and wall to ensure that the flooring has space to expand. The gap is concealed using baseboard or quarter round. There are 7 colors to choose from. Before deciding on Solid or Engineered hardwood flooring, consider these factors. The location is the most important factor to consider before the installation of hardwood or engineered flooring. The possible presence of moisture precludes traditional solid hardwood flooring from being used for below-grade installations. The manner in which engineered hardwood is constructed imparts additional structural stability to the product. It can be installed at any of the three grades after the use of moisture barriers such as Selitac Thermally Insulating Underlayment & Silent Step Ultra 3 in 1. What type of sub-floor do you have? Engineered products are best suited for installation over concrete; this ensures that the flooring maintains its structural integrity over a period of time. Both solid wood and engineered flooring can be installed over plywood, existing wood floors, and OSB subfloors. You can learn more from Shaw’s installation guidelines for subfloor installations. What if there is moisture in the room? There are 1 colors to choose from. The cost of solid versus engineered hardwood might vary based on the type of wood (e.g. maple is costlier than engineered floors) as well as the quality of wood. When you buy solid hardwood flooring, it can take longer to install. Final pricing is sometimes determined based on the layers to be under the top layer. For instance, there could be up to 12 layers of plywood below an engineered hardwood floor, in contrast to when you buy solid hardwood flooring. Discount Flooring Liquidators strives to provide you the best possible deals and trusted sales. We have a long reputation for high-quality flooring, having been in the market for more than 25 years. Our customers can be found across the nation and are of the utmost value to us! Since we buy in bulk from manufacturers, our customers can save on our low prices no matter what the flooring type. Our hope is to cultivate a long-term relationship with our customers so delivering on top-notch products is our mission. While most local stores function via middlemen, you can be sure that you are paying the right price directly when you deal with Discount Flooring Liquidators. Through Nationwide Trucking Accounts, we ensure that you can’t beat our prices with solid wood flooring for sale! In addition, our curbside delivery can make it hassle-free for you to get flooring at your driveway. Check out 4 of our stores, 29 Shaw Regional Distribution Centers, 35 of our Xpress Global Pickup Centers and multiple trucking firms – you will be spoiled for choice! Check out this nice DFL LOGISTICS Map HERE. Dealing with Discount Flooring Liquidators is easy, you will find us friendly, helpful and “IN Touch” with you through the whole process. You’ll receive an “Order Number”, a Receipt, and a “Tracking Number” ASAP when you order. We’ll stick with you as long as you need us too until your flooring is installed and your happy. Staying in touch is the number one goal when you order, call us anytime for any reason at 844-879-6698.